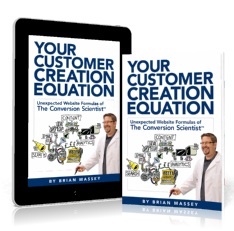 Brian Massey calls himself a Conversion Scientist and he has the lab coat to prove it. “Conversion” is the process of converting Web traffic to leads and sales, and his practice, Conversion Sciences, brings these disciplines to businesses of all sizes. Brian is a dynamic speaker, presenting before corporations, universities, and at national conferences. He is the author of the The Conversion Scientist, and is a columnist for ClickZ.com and Search Engine Land. Follow me on Twitter @bmassey. One of the easiest yet most often overlooked marketing tactics is the call to action. I recently gave you ideas on how to include calls to action in your content marketing, but where should you send people and what do you say? A landing page is a page on your site dedicated to delivering on promises made by the offers in your content. The goal is to get a consumer of your content to take another step toward becoming a customer. Your home page is not a good landing page. Instead, you want to send your prospects to a page where they are asked to do something specific and logical. So what makes a good landing page? Reader Sarah Mitchell responded to my last call for samples with a web page that illustrates how to integrate content marketing and landing pages. She wrote the product page for ezytire.com. I like this example because businesses tend to use this space to talk about themselves and their products. They forget about the visitor. A visit to your product page is a “buy sign,” making it a great place for calls to action. Mitchell does a good job of keeping the copy focused on the prospects, their businesses and their customers. She is also not shy about giving the prospect opportunities to take action. In 12 Ways to Get Readers to Take Action, I implore content marketers to put calls to action, also called Conversion Beacons, in their content marketing. 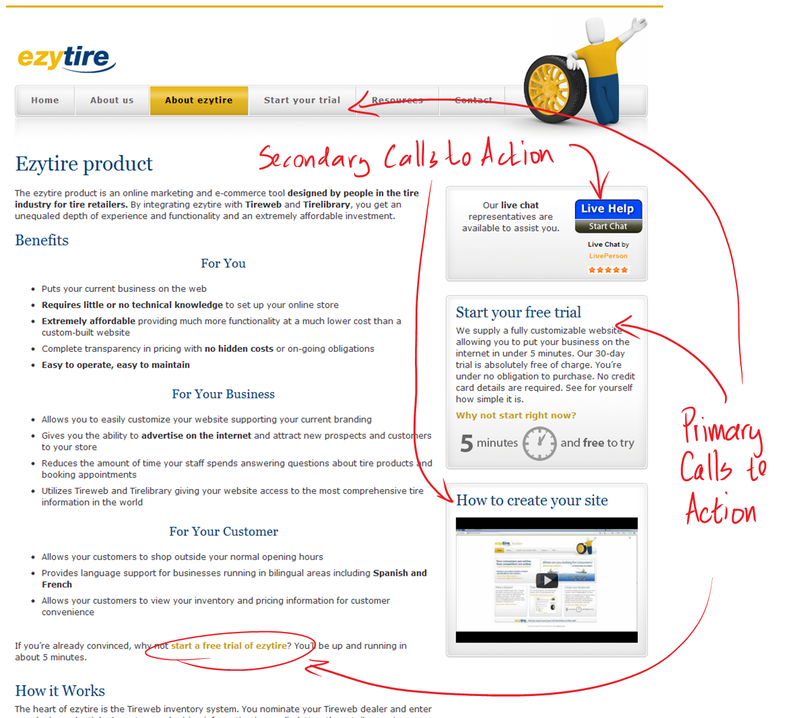 Mitchell’s ezytire page is the poster child for in-content and ad-based calls to action. Notice that there are not one, not two, but five calls to action on this page to start a free trial. In addition, she has secondary offers to start a chat, “register your interest,” and watch a how-to video. The bottom line is this: You never know when a prospect finally gets enough information to feel comfortable taking action, so you must always be offering ways for them to do so. Is this a bait and switch? It isn’t, and we should never attempt to mislead our prospects. The page offers details on the product. Contact information has been moved to a dedicated “Contact” page. Mitchell’s links go to a landing page that starts the trial enrollment process right away. 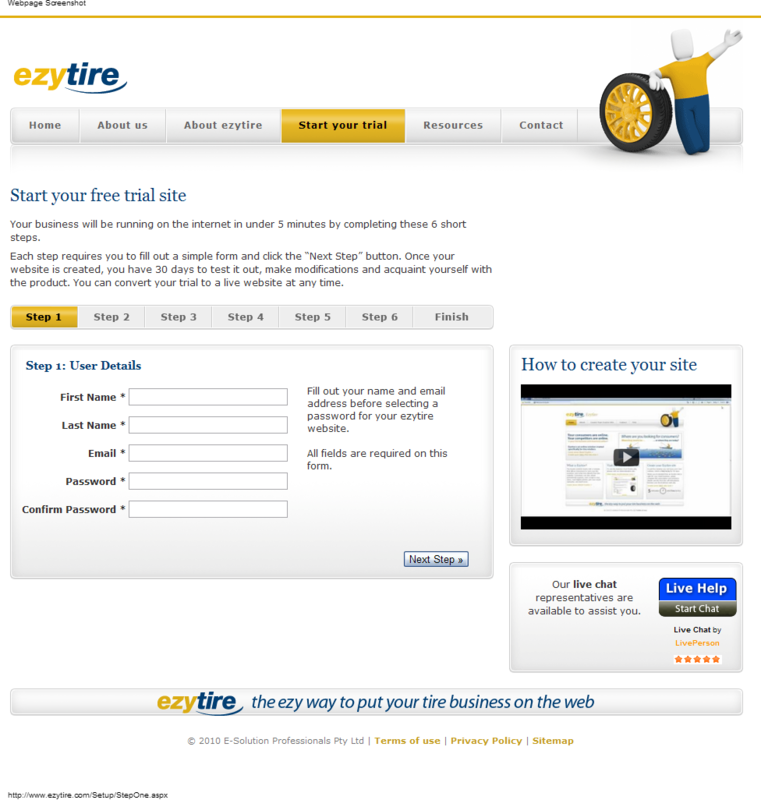 It should be obvious that sending visitors to the home page here would have been disastrous for ezytire. We know this page is working. The bounce rate is very low, with only 14 percent of visitors leaving the page immediately. That means the page isn’t scaring people away despite having a total of eight primary and secondary calls to action. Fully half of the visitors are starting a free trial, and 15 percent of them will purchase the service when their trial is over. That’s a beautiful bottom-line conversion rate of about 6.45 percent. Many businesses are proud of a two percent or three percent conversion rate from landing pages. Here are five things this page does well, things that you should consider when you develop your landing pages. The page is all about the trial, not about Ezytire. All of the content on this page is designed to help the reader get through the trial process. Ezytire should consider removing the top navigation as well to keep from distracting visitors. If it’s a pretty long conversion process, it’s considered a best practice to always let the visitor know where they are. You can see the “Step 1,” “Step 2,” etc. on the page that will provide the visitor with this feedback. Long forms can be more daunting to visitors than multiple steps. For a “soft” offer like a trial, I recommend shorter forms and more steps. You should try different approaches with your audience. The first step is pretty efficient: Name, email address, password. Ezytire could ask some qualifying questions, and may be tempted to ask for a phone number. Additional fields will, in general, decrease your conversion rates, so don’t ask if you won’t’ use the information. The ezytire page Sarah Mitchell inherited only generated nine conversions in three months before Sarah reworked it. If you’re not thinking, “I need someone like Sarah to look at my pages,” you’re not really a business person, or your pages would have bottom-line conversion rates above 7 percent. In my next post, I’ll share some ideas on how to find a great landing page copywriter. Help business owners pick good copy from the ineffective copy. Share a sample of copy you love or hate in the comments. We don’t want to embarrass any writers, but we’ll all benefit from the examples. There is an old yarn that, when it comes to a ham and eggs breakfast, the chicken is involved, but the pig is committed. Aren’t we all trying to get a reaction? A few months ago, I showed Content Marketing Institute members how to create a marketing reaction using some household chemicals and some simple lab equipment. I hid the science from you by talking primarily about converting a blog into an eNewsletter. We’ve all heard the message from the social media pulpit: social media marketing is about conversations and building one-to-one relationships. It’s about playing nice, being authentic, embracing transparency and doing so in a human voice. Melanie is your market research with an attitude, your analytics in a skirt. Bill is the voice that rings through the headsets of your customer support people, unwavering in his desire to get what he wants. Amy is that segment of your house list who got distracted before she finished ordering online. None of these people exist, but they are powerful guides for any business that wants to grow in an age of digital content. Melanie, Bill and Amy are touchpoint personas, and they can walk right into any meeting you have and “lay down the law.” They know what they want, and they are your ally in getting the resources you need to deliver. If you believe that your prospects don’t want to receive email from you, then you are missing a huge opportunity. HubSpot looked at data from 605 business blogs and found that they got 12 times more email subscribers than RSS subscribers on average. What your prospects don’t want is promotional email that only talks about you and your products. They want you to educate them, entertain them or both. So, where can you find a regular source of content that is educational, entertaining and easy to produce? Look no further than your blog. If your blog isn’t educational and entertaining, what’s the point of having one?